OAKLAND — Oakland Mayor Ron Dellums and U.S. Rep. Barbara Lee are not the only prominent East Bay politicians who, despite its tainted reputation, pledged support for Your Black Muslim Bakery by asking a bankruptcy judge not to dissolve the business to pay off creditors. Assemblyman Sandre Swanson, D-Oakland, joined Dellums and Lee — both his former bosses — and wrote a letter to U.S. Bankruptcy Judge Edward D. Jellen last month on behalf of the bakery when asked by a former associate of the late founder Yusuf Bey. But Oakland City Councilmember Larry Reid (Elmhurst-East Oakland) said he refused a similar request because bakery associates failed to repay a $1.1 million loan from the city of Oakland to establish a health care training program, and because of well-publicized criminal charges brought against many of the bakery’s leaders the past few years, long before a bakery handyman confessed to killing Oakland Post editor Chauncey Bailey on Aug. 2. Your Black Muslim Bakery, heavily mortgaged, deep in debt to the IRS and other creditors, and beset by internal battles for rightful ownership after the death of founder Yusuf Bey, filed for Chapter 11 bankruptcy in October. The company faced liquidation after failing to file the proper paperwork and make payments to the U.S. trustee’s office. Ali Saleem Bey, a longtime bakery associate who is not a blood relative of Yusuf Bey, said he made the rounds of elected officials to enlist their help to reverse a liquidation order. 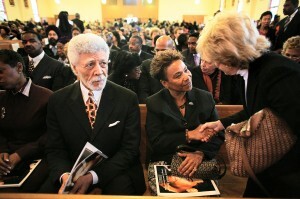 Despite the support from Lee, Dellums and Swanson, on Aug. 9 Judge Jellen refused to halt the liquidation. In the wake of Bailey’s slaying, Lee expressed regret for having supported the bakery; support she said she gave because of the organization’s historic contributions to the black community. And Karen Stevenson, the mayor’s communications director, explained that Dellums responded to a direct request from Ali Saleem Bey because he said he hoped to gain control of the bakery and return to its historical mission of helping the community by providing jobs, guidance and healthy foods. “We gave (the letter) to somebody who was trying to do right by the bakery and the community,” Stevenson said. Although Swanson could not be reached directly, his communications director Amber Maltbie said her boss was not aware of the bakery leaders’ problems with the law, and she said the office needs to do a better job vetting such requests in the future. “The letter was written based on the history of the bakery,” she said. “They’ve been in the community a long time, and they have done a lot for the community, although it’s clear that is no longer the case. “We made a mistake, we need to be more diligent,” she added. But a statement from Swanson issued a short time later via Swanson’s chief of staff Larry Broussard was not at all apologetic. The letter was a routine response to a routine request from a small business, nothing more, nothing less, he said. Broussard said it should serve as Swanson’s official statement on the matter, and Maltbie’s earlier response did not represent the official position of the assemblyman or his office. Reid said he respects John Bey, a former executive with the organization’s security company, and Ali Saleem Bey, both members of the organization’s old guard who are not associated with the troubled leadership, but that was not enough.